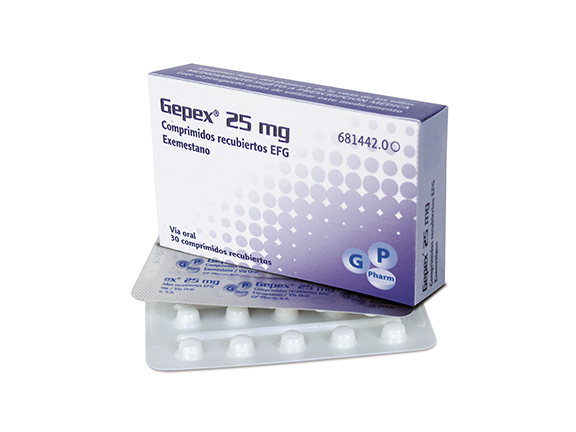 GEPEX® (Exemestane) is an anti-neoplastic agent of the family of steroidal aromatase inhibitors. GEPEX® is indicated for the adjuvant treatment of postmenopausal women with estrogen receptor positive invasive early breast cancer (EBC), following 2 – 3 years of initial adjuvant tamoxifen therapy. It is also indicated for the treatment of advanced breast cancer in women with natural or induced postmenopausal status whose disease has progressed following anti-estrogen therapy. Efficacy has not been demonstrated in patients with estrogen receptor negative status. GEPEX® is presented in blister packs of 30 and 100 tablets of 25mg strength.